Fokker's factory was not up to the task of meeting all D.VII production orders. Idflieg therefore directed Albatros and AEG to build the D.VII under license, though AEG did not ultimately produce any aircraft. Because the Fokker factory did not use detailed plans as part of its production process, Fokker simply sent a completed D.VII airframe for Albatros to copy. Albatros paid Fokker a five percent royalty for every D.VII built under license. Albatros Flugzeugwerke and its subsidiary, Ostdeutsche Albatros Werke (OAW), built the D.VII at factories in Johannisthal (designated Fokker D.VII (Alb)) and Schneidemx�hl (Fokker D.VII (OAW)), respectively. Aircraft markings included the type designation and factory suffix, immediately before the individual serial number. Some parts were not interchangeable between aircraft produced at different factories, even between Albatros and OAW. Additionally each manufacturer tended to differ in nose paint styles. OAW produced examples were delivered with distinctive mauve and green splotches on the cowling. All D.VIIs were produced with the lozenge camouflage covering except for early Fokker-produced D.VIIs, which had a streaked green fuselage. Factory camouflage finishes were often overpainted with colorful paint schemes or insignia for the Jasta, or the individual pilot. Albatros soon surpassed Fokker in the quantity and workmanship quality of aircraft produced. With a massive production program, over 3,000 to 3,300 D.VII aircraft were delivered from all three plants, considerably more than the commonly quoted but incorrect production figure of 1,700. In September 1918, eight D.VIIs were delivered to Bulgaria. Late in 1918, the Austro-Hungarian company Mx�G (Magyar x�ltalx�nos G�pgyx�r - Hungarian General Machine Company) commenced licensed production of the D.VII with Austro-Daimler engines. Production continued after the end of the war, with as many as 50 aircraft completed. Many sources erroneously state that the D.VII was equipped with the 160 hp Mercedes D.III engine. The Germans themselves used the generic D.III designation to describe later versions of that engine. In fact, the earliest production D.VIIs were equipped with 170-180 hp Mercedes D.IIIa. Production quickly switched to the intended standard engine, the higher-compression 134 kW (180 hp) Mercedes D.IIIax�. It appears that some of the early production D.VIIs delivered with the D.IIIa were later re-engined with the D.IIIax�. By the summer of 1918, a number of D.VIIs received the "overcompressed" 138 kW (185 hp) BMW IIIa, the first product of the BMW firm. The BMW IIIa followed the SOHC, straight-six configuration of the Mercedes D.III, but incorporated several improvements. Increased displacement, higher compression, and an alititude-adjusting carburetor produced a marked increase in speed and climb rate at high altitude. Because the BMW IIIa was overcompressed, using full throttle at altitudes below 2,000 m (6,700 ft) risked premature detonation in the cylinders and damage to the engine. At low altitudes, full throttle could produce up to 179 kW (240 hp) for a short time. 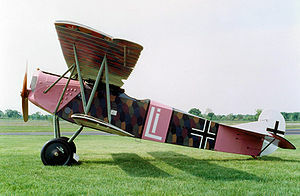 Fokker-built aircraft with the new BMW engine were designated D.VII(F), the suffix "F" standing for Max Friz, the engine's designer. Some Albatros-built aircraft may also have received a separate designation. BMW-engined aircraft entered service with Jasta 11 in late June 1918. Pilots clamored for the D.VII(F), of which about 750 were built. However, production of the BMW IIIa was very limited and the D.VII continued to be produced with the 134 kW (180 hp) Mercedes D.IIIax� until the end of the war. With the D.IIIax�, the D.VII was a very competitive fighter, but with the BMW IIIa, it was superlative. The D.VII entered squadron service with Jasta 10 in early May 1918. The type quickly proved to have many important advantages over the Albatros and Pfalz scouts. Unlike the Albatros scouts, the D.VII could dive without any fear of structural failure. The D.VII was also noted for its ability to climb at high angles of attack, its remarkably docile stall, and its reluctance to spin. It could literally "hang on its prop" without stalling for brief periods of time, spraying enemy aircraft from below with machine gun fire. These handling characteristics contrasted with contemporary scouts such as the Camel and SPAD, which stalled sharply and spun vigorously. Manfred von Richthofen died only days before the D.VII began to reach the Jagdstaffeln and never flew it in combat. Other pilots, including Erich Lx�wenhardt and Hermann Gx�ring, quickly racked up victories and generally lauded the design. Aircraft availability was limited at first, but by July there were 407 on charge. Larger numbers became available by August, when D.VIIs achieved 565 victories. The D.VII eventually equipped 46 Jagdstaffeln. When the war ended in November, 775 D.VII aircraft were in service. The Allies confiscated large numbers of D.VII aircraft after the Armistice. The United States Army and Navy evaluated 142 captured examples. Several of these aircraft were reengined with American-built Liberty L-6 motors, very similar in appearance to the D.VII's original German powerplants. France, Great Britain, and Canada also received numbers of war prizes. Other countries used the D.VII operationally. The Polish deployed approximately 50 aircraft during the Polish-Soviet War, using them mainly for ground attack missions. The Hungarian Soviet Republic used a number of D.VIIs, both built by MAG and ex-German aircraft in the Hungarian-Romanian War of 1919. The Dutch, Swiss and Belgian air forces also operated the D.VII. The aircraft proved so popular that Fokker completed and sold a large number of D.VII airframes that he had smuggled into the Netherlands after the Armistice. 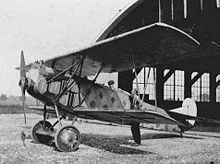 As late as 1929, the Alfred Comte company manufactured eight new D.VII airframes under licence for the Swiss Fliegertruppe. The widespread acquisition of the D.VII by Allied countries after the Armistice ensured the survival and preservation of several aircraft. One war prize was captured in 1918 when it accidentally landed at a small American airstrip near Verdun, France. Donated to the Smithsonian Institution by the War Department in 1920, it is now displayed at the National Air And Space Museum in Washington, D.C. Two other American war prizes were retained by private owners until sold abroad in 1971 and 1981. They are today displayed at the Canada Aviation Museum, in Ottawa, Ontario, and the Militaire Luchtvaart Museum in Soesterberg, Netherlands, respectively. The latter aircraft is painted in fictitious Royal Netherlands Air Force markings. A former Marine Luchtvaartdienst D.VII was discovered in a German barn in 1948. 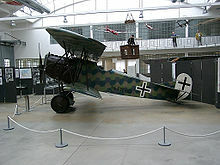 This aircraft is now displayed at the Deutsches Museum in Munich, Germany. Both Canada and France also acquired numerous D.VII aircraft. A former war prize, one of 22 acquired by Canada, is displayed at the Brome County Historical Society, in the Knowlton neighborhood of Lac-Brome, Quebec. This unrestored Albatros-built example is the only surviving D.VII that retains its original fabric covering. 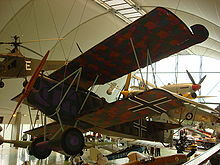 Of the aircraft sent to France, examples are today displayed at the Royal Air Force Museum in Hendon, England, and the Mus�e de l'Air et de l'Espace in Paris, France. Many modern D.VII replicas have been built. Most flyable examples are powered by Ranger or Gypsy Queen inverted inline engines. These engines must be turned upright to produce the correct thrust line, thus requiring a new oiling system. A few flying replicas are equipped with original Mercedes D.III engines. Gray, Peter and Owen Thetford. German Aircraft of the First World War. London: Putnam, 1962. Owers, Colin. ""Especially... The D.VII...": The post-1918 career of the Fokker D.VII: Part One". Air Enthusiast, No. 60, November-December 1995, pp. 63-70. ISSN 0143-5450. Owers, Colin. ""Especially... The D.VII...": The post-1918 career of the Fokker D.VII: Part Two". Air Enthusiast, No. 61, January-February 1996, pp. 52-63. ISSN 0143-5450. Swanborough, Gordon and Peter M. Bowers. United States Military Aircraft since 1908. London: Putnam, 1963.